Choose from hotel rooms with full kitchenette that can accommodate a family of 3, or a variety of camping sites for your tent, RV, trailer, or pop-up. All accommodations include newly upgraded wifi and free hot showers. See below for more detailed description of each option. Choose a private secluded site or join a few together for your family adventure. Some are very secluded and shady while others are sunny and open. Every site features a fire pit, and a picnic table. Also included are free showers, wifi and a charging station. Our serviced RV sites are located throughout the campground. You can be closer to the creek or the rocks, the choice is yours. Each one has full water, sewer and 30amp power (except where noted). Cable is available for an extra fee. 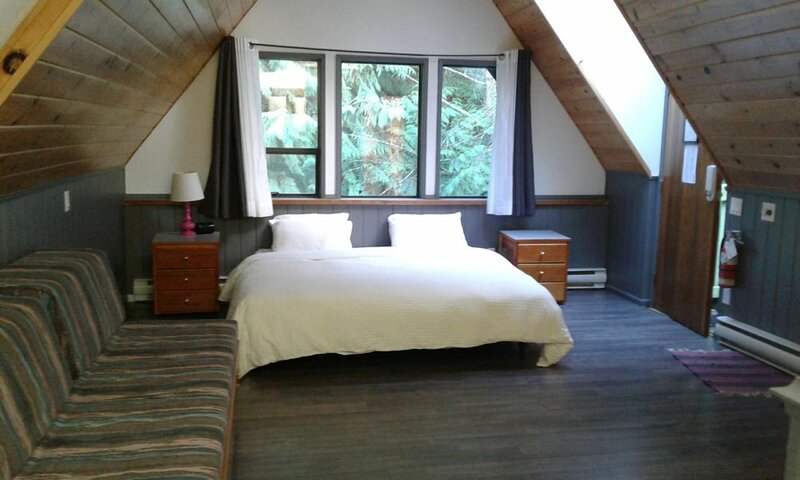 Our cozy cabin like hotel rooms are a great alternative to camping yet you are still surrounded by nature. Each room includes a kitchenette, king size bed, private bathroom and a Nespresso machine. Suitable for up to 2 adults and 1 child (12 and under).